Some of you may be wondering how it might be possible to survive sickness in your household and teach school all day? Since I am in the midst of caring for Sick Children right now, I thought I’d offer a few tips of advice. This is mostly to encourage myself and cheer on the rest of you, who may be suffering from this most taxing and exhausting dilemma. 1. Don’t clean your house. Or if you must, just make your bed and call it good. Heck, your bed is probably still made from yesterday because you didn’t sleep in it anyway. You were sitting in the rocking chair, holding a screaming baby all night. 2. Put lipstick on. This should go without saying. Not only is lipstick fun, but it brightens everyone’s day. Especially if you’re not in the habit of wearing it. Your husband and children will wonder what came over you. And when you look in the mirror, you will not notice the dark circles around your eyes, but will instead, be stunned by the awesomeness of Hot Pink Lips. You might even laugh at yourself, which is good. 3. Reduce school to a minimum. This is a very good time to renew your subscription to Audible, purchase The Story of Civilization, and commence History Class. When your children are finished with this, send the healthy ones outside for the remainder of the day for Nature Study. If the healthy children do not want to do Nature Study, offer House-Cleaning 101, wherein all children scrub floors, walls, and toilets. 4. Spend an extra amount of time styling your hair. Why? Because you’re sleep deprived and look like it. There are statistics out there saying that if you look put-together, you will feel put-together. Paul Harvey, the decades-long iconic radio broadcaster, used to wear a suit and tie every day for his program. And his studio was in his house, where virtually no one saw him. But he knew that his performance was always better if he dressed the part. So, this morning, I dug out my curling iron and spent five extra minutes curling my hair. Then, I sprayed it with lots of hair spray. And yes, it made me feel better about not sleeping last night. 5. Decide not to yell at your children. You are going to have a demanding day. Just face it. If the baby was up all night crying, he’s going to be crabby and cry all day too. So, your nerves are shot. You will be seriously tempted to yell at your other children. Just don’t do it. This will take a tremendous amount of effort and a lot of prayer. And in some cases, like mine, it will take a minor miracle. See my post HERE on that one. 6. Eat takeout or something frozen for supper. Eating Little Caesar’s Pizza every once in awhile won’t kill you. In fact, it might save your sanity. And I’ve found that those $4.98 rotisserie chickens from Sam’s Club are handy too. The best part is, they’re hot and ready to eat, and I’ve done nothing to prepare them. Someone I know gave me that great bit of advice. She also said to top it off with a bag of baby carrots and a bag of buns. Smart, smart woman. 7. Spend more time in prayer. Why? Because you’re sleep-deprived and well, crazy from holding a screaming baby all night. All sleep-deprived, crazy people need a lot of prayer. I know this from experience. The tricky part is making time to do it. I suggest leaving your house and spending an hour in silent Adoration. 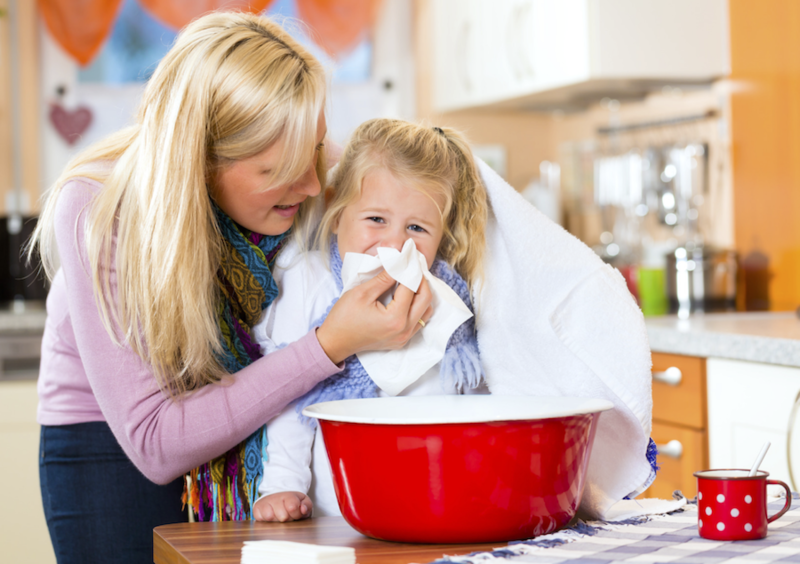 Hire a babysitter, call grandma, ask your husband to take sick leave…anything. This hour of Adoration may be the only time you will get to sleep, until the illnesses go away. And yes, sleeping in Adoration still counts as prayer. 8. Drink More Coffee. It’s a given that this helps, right? I’ve also heard that having a teenager helps too, because then she can babysit. Well, I’m working on that one. But I’m afraid it’s still going to be two more years until that one becomes a reality.